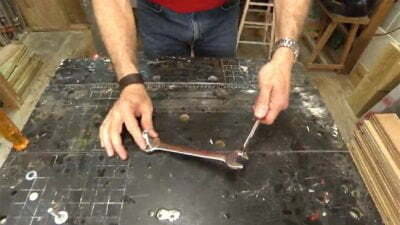 Combination wrenches and box-end wrenches are two of the most common tools you reach for when you need to loosen a nut. But, they do have their limitations. They’re relatively short, so they don’t provide much leverage. And, you often don’t have a wrench to fit the exact size nut you need to loosen. Watch the video for Simple Solutions to these common problems. Great hacks. I had Never even considered the second one. I don’t think I would try it on the wrong size bolt personally, If it’s loose enough for this technique to work a large pair of channel locks should get it done with less chance of damage to the nut. I will definitely be trying this the next time I run into a stripped nut though! I can see a lot of potential for going up a 16 of and inch and jamming in a screwdriver or coin. To get a bit nitpick your wrench extension here isn’t adding as much force as possible, it’s all about increasing the diameter of the circle around the bolt the force is being applied to (the Foot in Ft. Lbs). If you hook it over in the other direction the wrench will be facing almost straight out instead of at 90 degrees, giving far better leverage. Love your show. Never thought about doing thi. Such a good idea. Just retired and learning a lot of new ways to fix up our old house. It needs lots of fixing up. LOL we’ve enjoyed watching your daughter growing up and she’s given me ideas for decorating as I don’t have much of a flair but learning every day. I took a sheet n made a deck cover to keep the sun out. Was happy the wat it turned out. Keep up the good work. Thank you for these incredible tips – just the other day I was trying to find a wrench that would fit a bolt I needed to loosen. Now I know the trick – You are brilliant!! The wrench extension I have used before. The second hack with the wrench filler is a great idea! I never thought of it before. I’ll use it now. On a well pump the bolt that you prime the pump we can’t get the bolt out. We have used a pipe wrench with a cheater bar and it on there really good. How would you get it out? Using a screwdriver is fine when you have room to use both hands, sometimes you can add a washer or even a coin on its edge to fill the gap. Also you can fill the gap with a rubber band and it will help prevent the wrench from slipping off..!! I do not agree about using wrong size wrench by sticking a flathead to fill the space. If you must do that then you shouldn’t be playing with nuts and bolts!!!!! !